The Urban Redevelopment Authority (URA) launched the second land parcel1 in Paya Lebar Central for sale by public tender today. 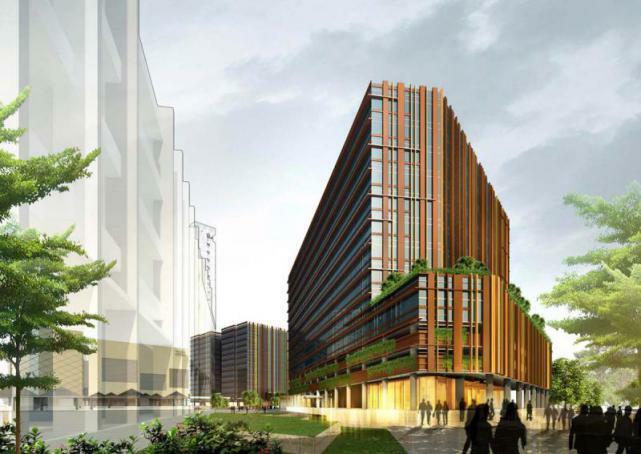 This mixed-use site, which comprises office, retail and residential uses, can generate about 165,000 sqm of gross floor area (GFA) and will be a key development in the Paya Lebar Central. As part of our decentralisation strategy, commercial clusters outside the city centre are created to provide job opportunities closer to homes, and reduce congestion and travelling times to and from the city centre. Located at the fringe of the city centre, Paya Lebar Central is envisaged to be a bustling commercial centre with a mix of office, retail and residential developments and attractive public spaces. The precinct has about 12 hectares (ha) of land available for development and a total potential commercial floor space of about 500,000 sqm. Paya Lebar Central will provide an attractive and accessible location for businesses that prefer to be located outside the Central Business District. The area is shaping up well with new developments such as Paya Lebar Square, One KM and the Workforce Development Agency’s Lifelong Learning Institute. Together with the Geylang Serai Market and the future Wisma Geylang Serai, the developments will enhance the Geylang Serai Precinct which has traditionally been a cultural and commercial hub for the Malay community. Please refer to Annex 1 for more information on Paya Lebar Central and details of these developments. Located next to Paya Lebar Interchange MRT station, the 3.9 ha site at Paya Lebar Road / Sims Avenue enjoys direct connection to both the Circle Line (CCL) and East-West Line (EWL) stations, as well as excellent frontage along Paya Lebar Road, Sims Avenue, Tanjong Katong Road and Geylang Road. The development of the site will continue Paya Lebar Central’s transformation into a major commercial centre at the city fringe. The future development is envisioned to be a quality mixed-use development comprising office, retail and residential uses. At least 90,000 sqm of the maximum permissible GFA of the development will be set aside for office use. The remaining GFA can be for additional office, retail, entertainment, food & beverage (F&B) and residential uses that will contribute to the attractiveness of the development as a destination for business and leisure. Geylang River, a key feature in the plans for Paya Lebar Central, provides opportunities for attractive public spaces. The future development will incorporate a public plaza next to Paya Lebar MRT station and a landscaped pedestrian mall along and over the section of the Geylang River that flows through the sale site. These public spaces, which will be linked by comprehensive networks of pedestrian walkways, cycling paths and park connectors, can stage public events and be the focal points of activities for the local community, pedestrians, shoppers and businesses. SINGAPORE — The tender for a large mixed-use site in Paya Lebar Central has attracted bullish bids from developers, underlining their confidence in the prospects of the area as a regional hub as well as in Singapore’s long-term prospects. The nearly 4-ha site on Paya Lebar Road and Sims Avenue garnered a top bid of S$1.67 billion, or around S$942.56 per square foot per plot ratio (psf ppr), from a group consisting of Roma Central, Milano Central and Verona Central, said the Urban Redevelopment Authority at the close of tender yesterday. The three entities are linked to Australian developer Lend Lease, said analysts that include Cushman & Wakefield’s director of research Christine Li. Ms Li said the highest bid was near the top end of the S$850 to S$950 psf ppr that the market had forecast. The 99-year leasehold plot was launched for sale by tender in October last year from the Confirmed List of the Government Land Sales programme for the second half of 2014. It is the second land parcel in Paya Lebar Central to be put up for sale, as part of the Government’s decentralisation strategy to develop commercial centres at the city fringes. The site can generate about 1.78 million sqf of gross floor area, but at least 969,000 sqf must be set aside for office use, with the rest for commercial, retail and residential uses. Given the size of the site and scale of development, it was no surprise that four of the six bids consisted of consortiums. The top bid was 8.8 per cent higher than the second-best bid from a consortium of six trustee managers linked to a diverse group of large developers. “The six bids for the Paya Lebar mixed-use site demonstrate continued confidence in Singapore as a global commercial hub,” said Mr Desmond Sim, head of South-east Asia research for CBRE. “The top bidder is clearly looking forward to Singapore’s long-term growth prospects backed by sound economic fundamentals, and not with a rear view. “The Metropolis and the one-north cluster of offices testify to the resounding success of the growth of sub-regional centres. 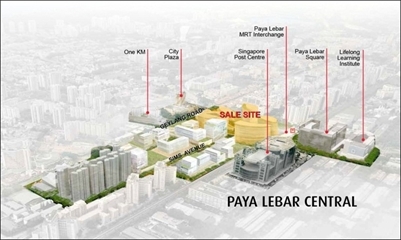 From the bids, it is clear that the bidders are confident that Paya Lebar will see the same level of success,” he added. Analysts said that developers were drawn to the attractive location, which is adjacent to Paya Lebar Interchange MRT station, and its connectivity through four main roads: Paya Lebar Road, Sims Avenue, Tanjong Katong Road and Geylang Road. In addition, the office segment is firmly on the uptrend and has outperformed both residential and industrial sectors, said Cushman & Wakefield’s Ms Li. “The light industrial clusters nearby could complement and provide service lines for future office occupiers … By disallowing developers to strata-subdivide the office component beyond five strata lots, the premium quality of the office building is preserved,” said Ms Li. “This will likely attract listed companies and multinational corporations to establish their headquarters in the building, enhancing the overall attractiveness of the commercial hub,” she said. However, Mr Ku Swee Yong, chief executive officer of property agency Century 21, warned that the commercial sector may see more challenging times ahead given rising interest rates, which may make it difficult for the top bidder to recoup the investment for many years. Register for the latest information on Paya Lebar Quarters/ Park Place Residences by filling up your details below!